Utterly beautiful and a wonderful means of storing items of clothing and household objects, the Elysee Merchant Chest is a stunning addition to the bedroom. A culmination of mirror polished glass and enchanting crystal handles make the Elysee Merchant Chest absolutely stunning. Easily able to adhere to regal and contemporary decors, the rich design of the Elysee Merchant Chest features delightful legs that both support the frame and its sense of style. This solid design is only enhanced by the aforementioned crystal handles, which don't just look noble but their miniature nature grant a greater focus on the overall mirror shine. With four concise drawers, two medium drawers and two large drawers, the Elysee Merchant Chest can comfortably accommodate a wealth of possessions. Particularly a brilliant fit into bedrooms, the Elysee Merchant Chest can easily host a wide variety of clothing. Though the Elysee Merchant Chest is mostly assembled as soon as it arrives, the construction process to finish the piece is relatively short and simple. Able to be fixed to the wall and with the handles requiring special attention, the Elysee Merchant Chest comes paired with easy to follow and comprehensive instructions. 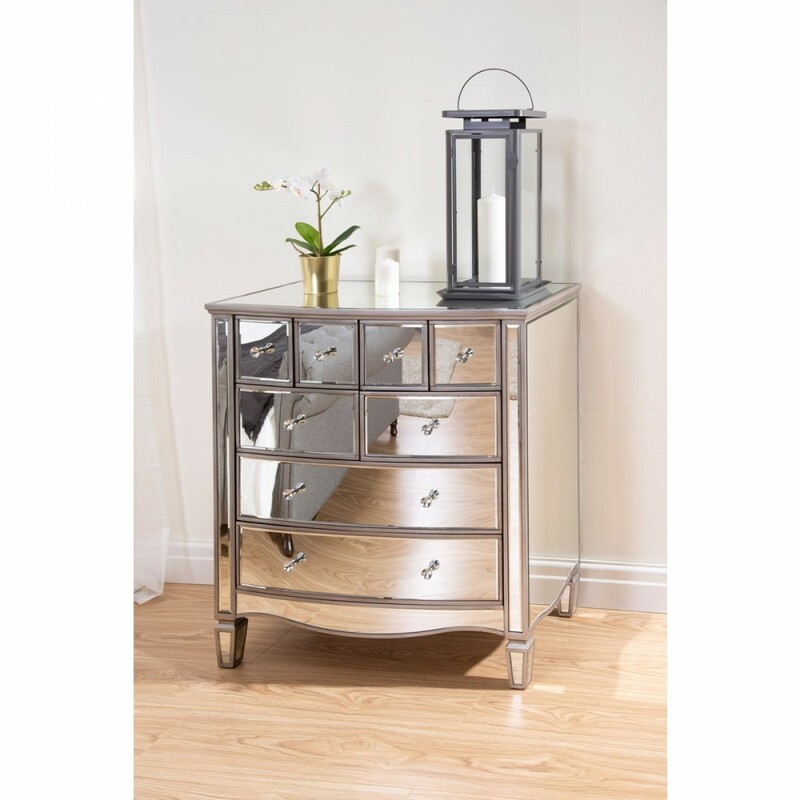 The Elysee Merchant Chest is part of the Elysee Mirrored Wooden Bedroom Furniture Collection.